Sharks. They’re everyone’s favorite underwater enemy. Between nerve-wracking drama’s like Jaws to stories about prehistoric mega-sharks, we have all but made the shark species a completely fictionalized being. But, scientists at the Smithsonian Environmental Research Center in Edgewater, Maryland, are changing that one tag at a time. May 14, 2018—Our shark tagging adventure began with an eight-hour car ride from the SERC campus outside of Baltimore, down the East Coast of the United States to Morehead City, North Carolina. While others had planned on joining us, I was the only team member making the journey with Chuck Bangley, a SERC marine ecologist at SERC. So, we loaded our government issued mini-van, stopped at Dunkin Donuts and hit the road. May 15, 2018, 7:00 am— “If you start feeling sea sick just remember, feed the fish not the birds,” instructed a crew member on the R/V Capricorn as he addressed the 10 passengers that would be heading out on today’s trip. Chuck and I are among other researchers from the University of North Carolina’s Institute of Marine Science. Some of them are interested in sharks, just like Chuck, while some are looking for squid or eels. Captain Joe stops for gas, filling up the 200-gallon tank before we head out to sea. “I don’t see many white caps out there yet, but storms are in the forecast, so it might get rough,” he says, clearly excited as he steers the vessel towards the open ocean. First item on today’s agenda is to “trawl” for about 15 minutes. To do this, the deckhands lower a large net with wooden and metal pallets at the ends to drag along the seafloor, collecting bait for the rest of the journey. As we float along, our net following behind, we catch the attention of a pod of dolphins that trail the net closely, making an easy meal out of the fish that narrowly avoid the net and an exciting spectacle for all on the boat. As we reel in the net and dump its contents on deck I hear Chuck call out with excitement, “Dogfish!” That’s the shark he was searching for. 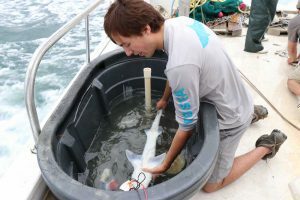 A UNC undergrad student grabs the small shark and places it in a black plastic tank filled with seawater. “Flip it over onto its back,” instructs Chuck. Doing this helps subdue the shark by putting it into an almost unconscious state. He readies his surgical equipment, slips on blue latex gloves and grabs a scalpel to tag the shark. In order to implant the acoustic tracker, the study procedures require Chuck to perform a small surgery on the sharks. 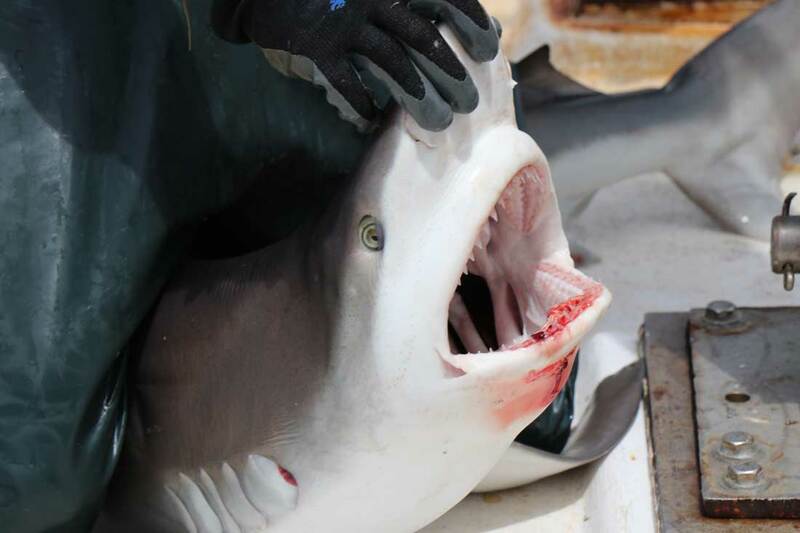 He gives the aquatic patient a small shot of lidocaine to numb the area, makes a small incision on the shark’s underbelly, inserts the small black cylindrical instrument and stitches the wound closed—all in under five minutes. After the procedure is complete, they roll the shark back onto its stomach, making sure it is alert and moving well before it gets tossed for a dive back into the ocean. After sorting through the rest of the net full of fish – squid, crabs and some of the biggest shrimp I’ve ever seen (which the crew happily set aside for their dinners) we were ready to continue fishing for the “big dogs”— more sharks. Our first stop was just a mile off the coast. The crew began lowering a line of buoys and metal fish hooks loaded with our bait, impaled but still flailing, into the water. One buoy, 10 hooks. That was the order we followed in a smooth and practiced routine. The first couple of hooks come up empty but then the frenzy starts – one, two, three sharks about 3-feet long each are pulled aboard. 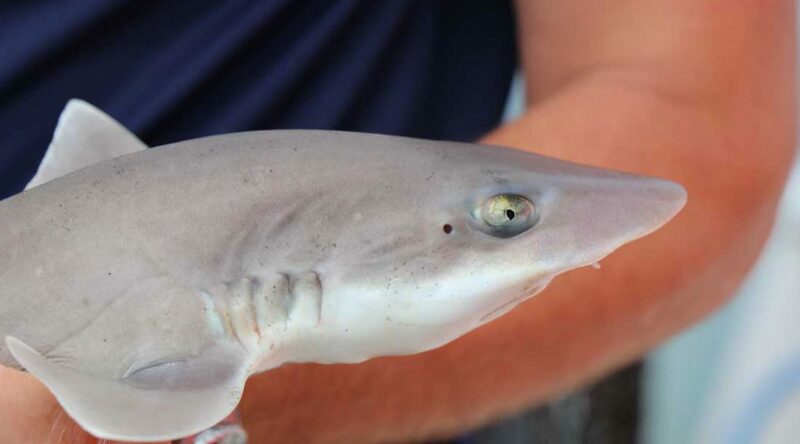 They are Sharpnose sharks, not a species Chuck is looking for, but ones UNC scientists are tagging in a separate study. Grab a shark – measure to the fork in its tail, to the tip of the tail – tag it – throw it back – repeat. Over and over I watched as this series was performed in a shark assembly line. After about 30 hectic minutes, we had pulled in 15 sharks, none that can be used for SERC’s study but still an impressive population size that scientists rarely see on these trips. “I’m your good luck charm,” I say joking. To my surprise, the team agrees and tells me to forget the rest of graduate school and join the crew instead. Next, we move farther off the shore to about seven miles out. We no longer can see land in any direction and the captain’s gadgets show that we are floating in water about 57 feet deep. The wind has begun to pick up causing swells about three feet tall to rock the boat side to side harshly. As I look out the window from the boats cabin one second I can see nothing but blue sky and the next the boat shifts and the window only shows dark blue water. We repeat the buoy and hook pattern as we cast again in the deeper water. Everyone takes the opportunity to eat some lunch while we wait. “Goldfish crackers are a must while out on a boat,” says Lewis, a student from the UK who is at UNC working towards his doctorate. We take bets on how many sharks we will catch this round. The buy in is a quarter and I bet high with hopes that my luck will continue — “12,” I say. Unfortunately, I didn’t win the bet since we only brought in two sharks. But, while the number was disappointing, the last catch was not. As we were nearing the end of the hooks, we pulled in a large Sandbar shark spanning about 5 feet long. She was not happy to be pulled up onto the deck and was flailing around violently, mouth open, teeth visible and bloodied from the hook. A deckhand jumped on top of the shark, straddling it and pressing down on its head to keep it from biting anyone on deck. The shark was quickly measured, tagged and shoved off the back of the boat into the deep waters. After that excitement it was time to make the long trip back to the docks. Some people on board began conversations while others, me included, settled in for a nap in the sunshine. As we reached the dock and gathered our belongings someone in the background asked Chuck if he thought the trip was successful. “Well, we are leaving with one more shark tagged than before, so I would say that is a success,” exclaimed Chuck with a smile as he stepped of the boat and back onto dry land.